I am pleased to be here today at the commissioning of RSS Stalwart and RSS Supreme. Today's commissioning completes a journey that we began about nine years ago when we awarded the contract to build the frigates. With all six frigates now brought into service, the RSN's Frigate Squadron is fully operational. 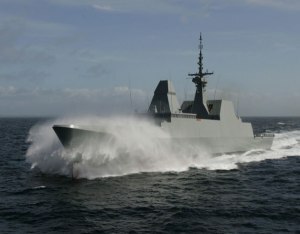 The Formidable-class frigates are a significant addition to the RSN Fleet. Equipped with a sophisticated Command, Control and Communications suite, as well as state-of-the-art combat capabilities, they are key nodes in the SAF's Integrated Knowledge-based Command and Control Network, able to perform a wide spectrum of missions and deal with various threats in all dimensions of naval warfare - surface, air and underwater. The full potential of our frigates will be realised when the Sikorsky S-70B naval helicopters are fully integrated this year. Our helicopter crews have been training in San Diego, California, since November 2007. And in the second half of this year, RSS Stalwart will be deployed to San Diego for six months to undergo integration training with the helicopters. These naval helicopters will extend the range over which the frigates can conduct anti-surface and anti-submarine operations. The frigates will help to defend Singapore from seaborne threats. But more importantly, with their longer range and reach, the frigates will significantly increase the RSN's ability to protect our Sea Lines of Communication (SLOCs). This is a critical mission as the lion's share of Singapore's trade is conducted by sea. Singapore is situated at the key international sea routes of the Straits of Malacca and Singapore, which link the Indian and Pacific Oceans. Threats to the freedom of navigation - whether they come from pirates or terrorists - will have an adverse impact on the economy and on regional peace and stability. 50% of global oil shipments, including 70% of Japan's oil imports and 80% of China's oil imports, pass through the Malacca Strait every day. As a littoral state Singapore will continue to work together with our neighbouring littoral states to ensure that the Malacca and Singapore Straits are safe to allow freedom of navigation for global trade. The piracy situation in the Malacca Strait has improved significantly in recent years. In August 2006, the Lloyd's Joint War Risk Committee decided to lift its classification of the Malacca Strait as a War Risk Zone. This success came after the littoral states took long-term measures to improve the security of the Strait. The Malacca Strait Patrol, which is an operational arrangement providing for coordinated patrols by the navies of Indonesia, Malaysia and Singapore, plays a key role in keeping the Malacca Strait safe. Under the Malacca Strait Patrol framework, the SAF conducts regular sea and air patrols using patrol vessels and the Fokker 50 aircraft. We are happy that Thailand has recently joined the regional effort. Thailand's participation will certainly boost the security of the Malacca Strait, especially at its northern reaches. Singapore is also an active contributor in developing concepts, ideas and models for cooperation in anti-piracy efforts. A good example is how Singapore has worked with Japan and regional countries to develop the idea of an anti-piracy centre. This initiative eventually led to the establishment of the Regional Cooperation Agreement on Combating Piracy and Armed Robbery against Ships in Asia (ReCAAP) and the ReCAAP Information Sharing Centre (ISC), which is housed in Singapore. Recently, a group of officials from Yemen visited the ReCAAP ISC to learn from our experiences so that they could set up a similar sub-regional information sharing centre that is modeled after the ReCAAP ISC. Similarly, the Information Fusion Centre (IFC), which will be located at the Changi Command and Control Centre, will allow maritime information to be collated and shared among our international security partners. This will enhance information sharing regarding the sea situation in our region and beyond, thereby promoting international and regional security cooperation. As a maritime nation, Singapore shares the concerns of the international community regarding the situation in the Gulf of Aden. We fully support the ongoing efforts by both the United Nations and the International Maritime Organisation (IMO) to address the piracy situation there. In 2008, Singapore co-sponsored UN Security Council Resolutions 1838 and 1846, to demonstrate our support for the international community to take greater efforts in the fight against these pirates. Through these resolutions, the Security Council called upon states and regional organisations to act in cooperation with the Somali Transitional Federal Government to fight piracy and armed robbery at sea off the Somali coast, in accordance with relevant international law. Singapore thus supports the efforts, such as those led by NATO and the European Union, as well as the contributions from various countries including the US, China, India and Russia, to protect commercial shipping from piracy in the Gulf of Aden. Such international participation, carried out in accordance with international law, demonstrates the important roles that user states can play to complement the efforts of the littoral states to combat piracy and create a safe maritime environment in key sea lanes. It also reflects the reality that no single state, acting on its own, has the necessary capabilities to solve the complex security challenges that we face today, and that international cooperation is required. This is a welcome development in global anti-piracy efforts as ships from various nations have now learnt to self-organise, communicate with each other and regional coordinating centres in a live operating environment. The situation in the Gulf of Aden is a complex one. While maritime security forces at sea can provide some measure of security, the long-term solution to the problem lies in resolving the underlying issues of economic development and governance ashore. The shipping community also has to play its part by undertaking proactive measures to enhance the security of their ships. They should make use of appropriate transit windows, speeds, and routing, such as the Maritime Security Patrol Area (MSPA) that has been established by the multinational maritime force assembled in-theatre, to safely transit their ships through the Gulf of Aden. A coordinated effort by the multinational maritime force and the shipping community would contribute to greater security in the Gulf of Aden and deter piracy. The Frigate Programme is one of the most advanced and complex ever undertaken by MINDEF. As in all our endeavours, our people and partners are critical in making the Frigate Programme a success. Integrating a multitude of complex systems into a seamless whole would not have been possible without the tireless efforts of the engineers and scientists from the Defence Science and Technology Agency and DSO National Laboratories. I would like to thank the team and their industry partners - French shipbuilder DCNS and ST Marine - for helping the SAF develop this important capability. Commissioning of these frigates into active service would not have been possible without the commitment and effort of the men and women of the RSN. It takes many months and years, of intensive training, harbour and sea trials, and developing new doctrines and battle tactics in demanding exercises, before these ships enter operational service. I know that this has not been an easy task, but I am sure that it has been a challenging and fulfilling one for the men and women of the RSN. Bringing all six frigates into service within nine short years, from contract signing to commissioning - on time, on budget and to specification - is a remarkable achievement for a programme of this complexity and scale. I commend all the men and women of the combined project team, RSN and the contractors for your hard work, professionalism and dedication. Your efforts have made this day possible. To all the men and women of the RSN, and also the RSAF, who will take these ships to sea: Always discharge your duties faithfully and fully, with commitment and with courage. I wish you all the best.